#TheSpaceBar® is a blog by Alex and serves as a ride-along journey on his personal quest to learn more about Outer Space-related facts, laws, science, policies, and regulations. For more information, visit the Onboarding. Disclaimer: This blog offers no legal advice, is not intended to be a source of legal advice, and does not create an attorney-client relationship. If you need legal advice, please seek out a lawyer directly. I am just a space cadet in this adventure, and after all, space law/policy can be like rocket science. For a little bit more than 30 years, the Space Shuttle—or formally, the Space Transportation System (“STS”)—had been the face of the American spaceflight program. While the July 21, 2011 landing of the Space Shuttle Atlantis marked the program’s official end, the retirement of the Space Shuttle program had been in the works for many years and was a direct result of the Space Shuttle Columbia disaster. But, the retirement of the Space Shuttle program was never going to mark the end of America’s space-faring dreams. As the first nation to send humans to the moon, the United States was never going to withdraw from deep space exploration. Yet, NASA’s search for the deep space exploration successor to the Space Shuttle has been arduous, with many twists and turns caused by changing presidential administrations, political considerations, and private competition. And while this journey is still ongoing today, it appears that the Space Launch System (or “SLS” for short—a name that harkens back to the formal name of its Space Shuttle forebearer) will be NASA’s official answer to the development of a next generation deep space vehicle for the exploration of Mars and beyond. As a first for #TheSpaceBar blog (and inspired by the Horizon Goal series by the Planetary Society), in a series of posts entitled “The SLS Saga,” I will explore the Space Launch System program: its beginnings, its specifications and objectives, its current status, and its future development. I hope this set of posts will act as a launching point for your continued exploration of space policy in America. In the coming weeks and months, as new posts in the SLS Saga become available, this post will be updated with links to new content here. In this Part One of the SLS Saga, we will explore the transition from the Space Shuttle to the start of the SLS program. 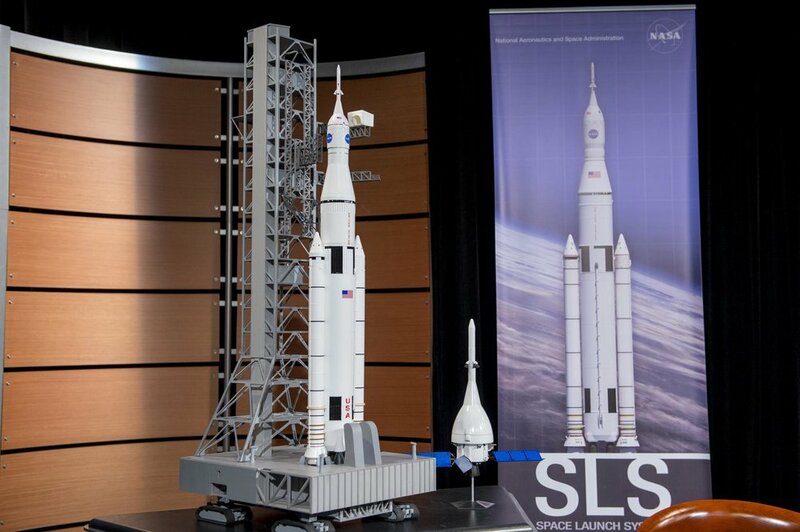 In this Part Two of the SLS Saga, we will explore SLS’s current configurations. In this Part Three of the SLS Saga, we will explore SLS’s first few missions. In this Part Four of the SLS Saga, we will explore SLS EM-1’s CubeSat payloads. In this Part Five, and final planned part, of the SLS Saga, we will explore SLS’s competition from the commercial sector and whether such competition will lead to its demise. #TheSpaceBar® is a blog by Alex and serves as a ride-along journey on his personal quest to learn more about Outer Space-related facts, laws, science, policies, and regulations. For more information, see Onboarding. Disclaimer: This blog offers no legal advice, is not intended to be a source of legal advice, and does not create an attorney-client relationship. If you need legal advice, please seek out a lawyer directly. I am just a space cadet in this adventure and after all, space law/policy can be like rocket science.